Still looking for more information about her past, the time-traveler Jesse Beckett goes back 30 years to further investigate the Flux mansion. Once again, she learns about dangerous time paradoxes and has to move between different ages to fix them while helping famous historical figures in trouble. 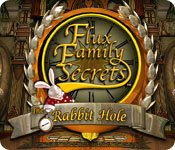 Like its predecessor, Flux Family Secrets: The Rabbit Hole is a hidden object game with adventure elements. As before, the main objective is to search the available locations for the scattered pieces of inventory objects. After being assembled, these items have to be used to solve puzzles or complete tasks by dragging them from slots at the bottom, and dropping them to appropriate and logical portions of the scenery. Shimmering portions of the scenery give access to the hidden object challenges, taking place on separate screens where the player has to find and click on all the objects listed at the bottom to complete them and receive key items. A list entry is written in blue when the item is not visible, and can only be collected after moving a piece of furniture out of the way or opening some compartment to reveal it. The radar screen at the bottom-right serves as the hint button, showing the silhouette of any selected list entry, and the exact position of one of the required items when activated. Mini-games take place inside windows at the center of the screen, where a mechanism of some sort has to be manipulated to solve them. They can be optionally skipped after a few minutes.